Linear Jewelry - This is a unique and bold handcrafted sterling silver bracelet that makes a big statement. The wide cuff is created from long round silver tubing soldered together and features a large Orthoceras Fossil from Morocco. This is a One-of-a-Kind. From our Linear Collection, this is a classic handcrafted sterling silver bracelet that is bold and makes a statement. The bracelet is created from long round silver tubing soldered together. 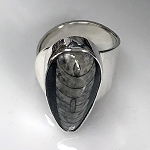 The bracelet cuff features a large Orthoceras Fossil, which was formed four hundred million year old in Morocco, that is fully bezeled in sterling silver. This is a One-of-a-Kind, but we accept custom orders for different stones and sizes. The bracelet is approximately 1.38" wide without the fossil and 2.36" wide with the fossil. The clasp closure is a special pin. The Orthoceras fossil is 2" long x .68" wide (52mm x 17.35mm). 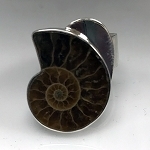 Orthoceras fossils helps balance emotions, increases confidence, helps the wearer transition from the old to the new. This Bracelet will fit a size 7" wrist. 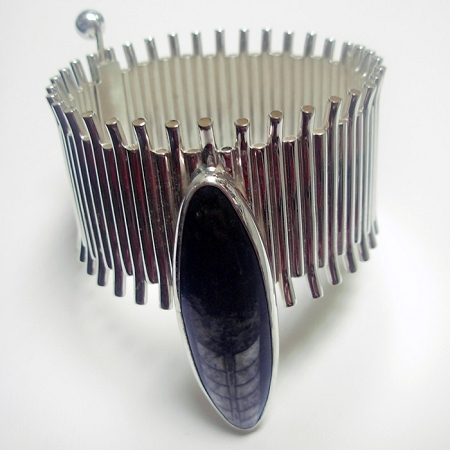 The bracelet is designed to fit somewhat snug on the wrist or arm to avoid the bracelet from turning. This bracelet is handmade in our studio and may vary slightly, but our attention to detail ensures that you are wearing a one of a kind high quality bracelet. 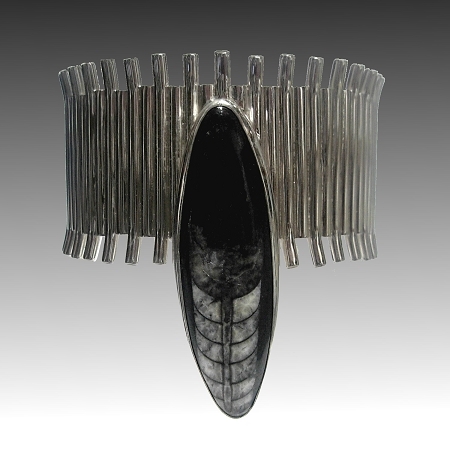 This is a truly unique piece that is designed, created, and signed by Aaron Rubinstein and Modern Art Jewelry.